We went as a family of 4. 16 yo son, 13 yo daughter. We have not been on Royal Caribbean in 10 years. We have tried Disney, Norwegian, Princess and Holland America but decided to take a short cruise as we didn&apos;t want to go for a week. I was hesitant to go on one of the older ships but the price point was right. I&apos;m not a fan of Nassau but I liked the idea of being able to spend more time at the Atlantis as the ship was leaving at 11:59 PM. We were able to rent a room at the Comfort Suites and have full access to the Aquaventure for the day. The ship under went a recent upgrade with a lot of fun activities for kids of all ages. Flowrider, water slides, Skypad, rock wall, Ice rink, mini golf. Some were new. The new Miami facility was a breeze to go through. We were on the ship in about 15 minutes. Our room was ready by 1 PM. 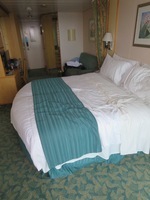 We had 2 balcony cabins on the Deck 8. Lots of storage and the balcony was a comfortable 8&apos; X 4.5&apos; with reeling chairs. The rooms have limited (one) USB port so you will need to bring your own. We got out bathing suits and went on the water slides. Lunch in the Windjammer was decent. I liked the paella. The windjammer is very well run with a lot of options. Dinners had a lot of vegetarian options for my son. We did my time dining and were always happy. After the first night we would order my sons vegetarian meal for the next night. The entire staff could not have been nicer. We didn&apos;t go to the specialty restaurants. My son enjoyed spending times with the other teens and liked the Escape Room. My daughter preferred Bingo and the teen facial. They have a decent gym with free weight and a lot of cardio machines including a stair mill. We all had a private lesson on the flowrider. We were disappointed that our stop at Coco Cay was cancelled as the seas were rough and we could not tender. The pier is still not ready. I saw one show but I really enjoyed all the live music. Drink prices were higher than I remember. $12 for a cocktail and $8 for a beer. We brought 2 bottles of wine on board and had them with dinner. The wait staff on the Mariner has been ranked #1 in the entire fleet and they work hard to maintain that distinction. I liked the "smaller" size of the ship. There were never any long lines or waits. There were many family groups as it was the winter break. The ship is well maintained, especially the public areas. I would go on this ship again and would recommend it to others. We went as a family of 4. 16 yo son, 13 yo daughter. We have not been on Royal Caribbean in 10 years. We have tried Disney, Norwegian, Princess and Holland America but decided to take a short cruise as we didn&apos;t want to go for a week. I was hesitant to go on one of the older ships but the price point was right. I&apos;m not a fan of Nassau but I liked the idea of being able to spend more time at the Atlantis as the ship was leaving at 11:59 PM. We were able to rent a room at the Comfort Suites and have full access to the Aquaventure for the day. The ship under went a recent upgrade with a lot of fun activities for kids of all ages. Flowrider, water slides, Skypad, rock wall, Ice rink, mini golf. Some were new. The new Miami facility was a breeze to go through. We were on the ship in about 15 minutes. Our room was ready by 1 PM. 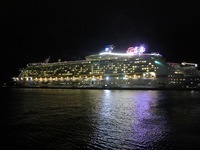 We had 2 balcony cabins on the Deck 8. Lots of storage and the balcony was a comfortable 8&apos; X 4.5&apos; with reeling chairs. The rooms have limited (one) USB port so you will need to bring your own. We got out bathing suits and went on the water slides. Lunch in the Windjammer was decent. I liked the paella. The windjammer is very well run with a lot of options. Dinners had a lot of vegetarian options for my son. We did my time dining and were always happy. After the first night we would order my sons vegetarian meal for the next night. The entire staff could not have been nicer. We didn&apos;t go to the specialty restaurants. My son enjoyed spending times with the other teens and liked the Escape Room. My daughter preferred Bingo and the teen facial. They have a decent gym with free weight and a lot of cardio machines including a stair mill. We all had a private lesson on the flowrider. We were disappointed that our stop at Coco Cay was cancelled as the seas were rough and we could not tender. The pier is still not ready. I saw one show but I really enjoyed all the live music. Drink prices were higher than I remember. $12 for a cocktail and $8 for a beer. We brought 2 bottles of wine on board and had them with dinner. The wait staff on the Mariner has been ranked #1 in the entire fleet and they work hard to maintain that distinction. I liked the "smaller" size of the ship. There were never any long lines or waits. There were many family groups as it was the winter break. The ship is well maintained, especially the public areas. I would go on this ship again and would recommend it to others. Comfortable if a bit small. The color pattern is dated. There was only one USB port and that was on the telephone next to the bed. Nice size balcony with reeling charts and a table.